We probably all know at least one person who has been driving around with a cracked windshield for months, or maybe even years. Maybe they think they can get away with it because they believe they can still see the road just fine, or maybe they are just trying to avoid what they think is an unnecessary vehicle repair expense. However, it is very important to get a cracked windshield replaced ASAP. Here’s why. First, it’s most likely illegal. Federal regulations mandate that the center of the windshield (any area further than 2 inches from the top of the windshield, further than 1 inch from the side, or above the steering wheel—roughly the area reachable by the windshield wipers) must be free from damage. A single-line crack can extend into this area, but it cannot intersect with any other cracks. Multiple, intersecting cracks or “spider-web” cracks always require windshield replacement. Second, it’s dangerous. Cracked windshields are weak windshields. You might be ok driving day to day, but if you’re in an accident or something else hits your windshield, the damage can be much more severe if you already have a windshield crack. If you have a weak windshield and the airbags go off, the windshield is more likely to shatter on impact from the air bags, and it can send shards of broken glass flying your way. A cracked windshield also impairs your vision—even if it’s on the passenger side of the car. Even if the crack starts out very small, it could expand at any moment without notice, leaving you blinded as you hurtle down the freeway at 60 miles per hour—that’s just an accident waiting to happen. 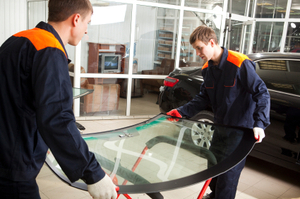 Third, windshield replacement or repair is not as hard or as expensive as you might believe. Sometimes your car insurance will even cover 100% of a cracked windshield replacement or repair, especially if you have comprehensive coverage. If you have a cracked or otherwise damaged windshield that requires windshield replacement, visit us at Freedom Glass Company in Mooresville, North Carolina. We can get you back on the road safely in no time!